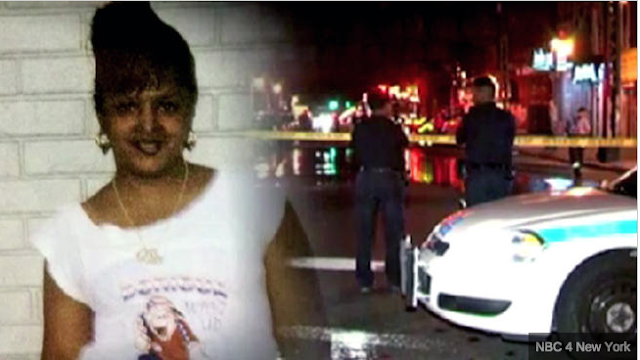 A garbage truck fled the scene after striking and killing a 46-year-old woman with multiple sclerosis using a walker to cross a Brooklyn street Thursday night as she headed home from visiting her mother, authorities and relatives say. The woman, identified as Alberta Bagu, was hit by the truck as she tried to cross the street near Broadway and Ditmars Street in Bedford-Stuyvesant around 10:30 p.m.
Police say Bagu was found unconscious on Broadway with severe trauma to her head and body. A preliminary investigation indicates the private sanitation truck was moving south on Broadway between Ditmars Street and Willoughby Avenue when it hit Bagu as she tried to cross mid-block, police said. Bagu's devastated longtime boyfriend, Edmund Pieters, said he couldn't help thinking her death was just a dream. "I'm still thinking she's going to walk into the door," Pieters said. "I can't even cry no more -- so much crying I did. Two more minutes and she would have been home; she was right there. Lanatte Flood, the dead woman's sister, said despite Bagu's disability, she continued to help others -- especially her mother. Flood described Bagu as a woman with "a very good heart" who was always "nice to people" and had a "wonderful sense of humor." As for the truck driver who hit her, Flood said, "My sister has been using a walker for quite some time now. And she knows how to use a walker. It was extended out. How could you not see that?"